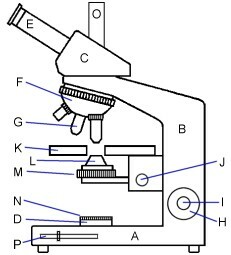 The diagram above left illustrates a typical monocular microscope of the early to mid 20th Century. The diagram above right illustrates a modern instrument with a fixed vertical limb, a horizontal stage, inclined eyepieces and in-built illumination. The basic operation is, however, the same. This section contains a glossary of some terms associated with the construction and use of the light microscope. The explanations are offered in a simplified form so as to be useful for those new to the instrument. Often marked on objectives, this is the thickness (in millimetres) of the coverslips that should be used. Often marked on objectives, this is the tube length (in millimetres) for which the objective is designed. Less common values include 170, 200 and 210. Often marked on modern objectives, indicating that they are infinity-corrected, instead of being corrected for a specific tube length. These objectives should not be expected to work well on a microscope from a different manufacturer. The simplest and cheapest form of substage condenser. A lens or lens system which is partially corrected (two colours) for chromatic aberration. Can apply to both condensers and objectives. A polarising filter that is used above the objective. Fixed in cheaper systems, can be rotated in more advanced systems. An iris diaphragm located within or immediately below the substage condenser. Controls the numerical aperture (NA) of the beam of light passing through the specimen to the objective. Reducing the NA below that of the objective increases contrast and depth of field, but reducing it too much introduces abberations. Should NOT be used to adjust the intensity of the illumination. A lens or lens system which is partially corrected (three colours) for chromatic aberration. The top-most part of a modern, modular microscope, fitted with a pair of inclined eyepiece tubes. A microscope with two eyepiece tubes allowing both eyes to be used for viewing the specimen. The main advantage of the binocular instrument is more comfortable and relaxed vision, particularly important when using the microscope for protracted periods. In a compound microscope, the image from the objective is split into 2 identical images that are seen through the eyepieces, so there is no stereo effect. In a stereo microscope, there are separate optical paths through the objectives, so the eyes see different images, and a 3D stereo image can be seen. A tube that forms the main part of the optical path in older microscopes, with an eyepiece at the end nearest the eye and an objective at the end adjacent to the object being viewed. In modern instruments, the tube has almost disappeared, and there is only a short distance between the nosepiece and the binocular (or trinocular) head. A convex lens mounted on a stand or adjustable arm, and used for concentrating light onto the specimen. A Victorian innovation. A defect in a lens that causes coloured fringes around parts of the image. A means of changing the distance between the objective and the slide, to bring the specimen into rough focus. In different models, the moving part can be the stage, the limb or the body tube. A design of stereomicroscope in which there is only one objective. The two eyepieces look through the same objective, but from left and right sides so as to produce two different views that can be combined to give a stereo image. Other stereomicroscopes use the Greenough design. An eyepiece that is designed for use with a matched range of objectives, and that corrects residual chromatic aberration and spherical aberration in the image produced by the objectives. A device with two or more lenses, held in the substage to concentrate the available light onto transparent specimens on the stage. A very thin piece of glass (normally square or round) placed over the microscopical specimen. Intended to help preserve the specimen, it also forms part of the optical system and its thickness etc. has to be taken into account when designing and using the instrument. A condenser designed for dark-ground examination of the specimen. Light is prevented from passing directly through the objective, and the image is formed by the light scattered by the object itself. The image appears bright against a dark background. A technique for giving colourless specimens a pseudo 3-dimensional appearance (as if illuminated by an oblique light source) and introducing false colours, capable of producing spectacular images. Requires a special condenser with a polariser and Nomarski or Wollaston prisms, special strain-free objectives, and an analyser and another Nomarski or Wollaston prism above the objective. An objective that is designed to be dipped into culture solutions to examine cell and tissue cultures; these objectives can also be used to observe pond life. A body tube of variable length, common before tube length was standardised. Changing the length of the tube affects magnfication (a longer tube gives more magnification), and also affects the image quality. The most common type of objective, designed to be used with an air gap between the specimen and the objective. The eyepiece, or ocular, is a lens system which produces the final magnification, from the primary image formed by the objective. A glass disc with a graduated line or cross, or a grid, that fits inside an eyepiece. After calibrating with a stage micrometer for a specific objective, can be used to accurately measure specimens. An iris diaphragm located either at the front of an external lamp, or on top of the base of a microscope with built-in illumination. Used to control the diameter of the beam of light entering the substage condenser, thereby reducing the effect of stray light. The diameter of the field of view of an eyepiece when used with a ×1 objective, measured in millimetres. The field number may be marked on the eyepiece near the magnification, for example 10×/18. Therefore, an eyepiece with an FN of 18 would have a field of view of 1.8 mm when used with a ×10 objective. A transparent piece of glass or plastic, normally circular, that is inserted into the optical path just below the condenser, so as to alter the colour or intensity of the light passing through the specimen. A means of adjusting the focus to finer limits, used after the image has been roughly focused using the coarse focus. The base of the microscope. A design of stereomicroscope in which there are two objectives. The two eyepieces look through different objectives so as to produce two different views that can be combined to give a stereo image. Other stereomicroscopes use the common main objective (CMO) design. 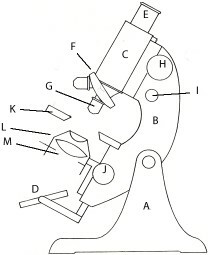 The top-most part of a modern microscope, available in monocular, binocular and trinocular versions. An objective with a high numerical aperture (NA) that is designed to be used with an air gap between the specimen and the objective. The theoretical maximum NA with an air gap is 1.0, and in practice the maximum is about 0.95. The thickness of the coverslip becomes critical for dry objectives with a high NA, and so they often incorporate a correction collar that can be adjusted to match a range of thicknesses, e.g. 0.14–0.22 mm. Refers to an eyepiece where the user’s eyes do not have to be very close to the eyepiece, making it possible for spectacles to be worn. A special oil that is used to bridge the gap between a specimen and an oil-immersion objective. Ideally, should also be used to bridge the gap between the top of the substage condenser and the bottom of the slide. A compound microscope in which the objective is below the stage, allowing specimens to be viewed from underneath. In biological versions, the lamp and condenser are above the stage, providing transmitted light. An adjustable, circular aperture, produced by a mechanism consisting of several thin pieces of metal that slide over each other. A good microscope will have two, the field diaphragm in the lamp system, and the aperture diaphragm in the substage condenser. The central part of the microscope which carries the main parts, such as tube, nosepiece, stage and substage. Refers to an objective for which the distance between the specimen and the objective is greater than normal. A stage fitted with an adjustable mechanism for holding and moving the slide, thus allowing precise positioning of the specimen. A microscope designed for looking at opaque specimens by reflected light. Specimens are illuminated by light coming through the objective (bright field), or through a cylinder around the objective that illuminates the specimen obliquely (dark ground). Metallurgical objectives differ from those for biological use in 2 ways; they are normally designed for use without a coverslip, and they are designed for use with a longer tube length such as 210 mm. Most early microscopes were fitted with a mirror (flat on one side and concave on the other) for directing the light source into the condenser. A microscope with a single eyepiece tube. A filter that reduces the intensity of the illumination without affecting its colour. Many microscopes are fitted with some form of rotatable nosepiece, capable of holding two, three or more objectives. The nosepiece can be rotated so that one of the objectives is in line with the optical system. The numerical aperture of an objective is a measure of its ability to gather light and to resolve fine detail. A higher NA produces a brighter image with more detail but less depth of field. An NA greater than 1.0 can only be achieved using oil immersion, water immersion, or other liquid immersion. The NA is normally marked on the objective, as a number between 0.04 and 1.4. The first part of the imaging system, placed close to the object. It forms the primary image,which is then further magnified by the eyepiece. Technique for increasing the NA above 1.0, by bridging the gap between the specimen and the objective with immersion oil. Must not be used with objectives that are not designed for oil immersion. Ideally, the gap between the top of the condenser and the bottom of the slide is also bridged with immerson oil. An objective that is designed to be used with a thin layer of immersion oil bridging the gap between the specimen and the bottom of the objective. Image quality is greatly reduced if these lenses are used without immersion oil. Ideally, immersion oil should also be used between the top of the substage condenser and the bottom of the slide. Refers to a range of objectives that are designed for use in the same nosepiece with minimal or no re-focusing when changing objectives. Also refers to a camera that is in focus at the same time as the image seen through the viewing eyepieces. The distance between the specimen and the nosepiece for which an objective has been designed. For many modern objectives, this distance is 45 mm; for older objectives it can be 37 mm, 33 mm, or other distances. A technique for making transparent colourless specimens visible, by converting differences in refractive index into differences in density. Needs special objectives and a matching condenser. A special eyepiece that is used to focus on the phase ring in a phase-contrast objective, to assist in aligning the matching annulus in a phase-contrast condenser. An eyepiece that is designed for use in the the vertical tube of a trinocular microscope, to project the image formed by the objective onto the film or sensor in a camera. A vertical tube at the top of a microscope that enables a camera to be attached. Taking photographs through a microscope. Note that microphotography is the production of very small photographs. A polarising filter that is used below the subject, and can normally be rotated. A special form of microscope designed for use with polarised light to examine specimens such as crystals, and ore and mineral samples. It consists of the normal microscope components with the addition of a polariser, analyser, rotating stage and other specialised attachments. Lighting for opaque specimens, provided by external lamps (as used with stereo microscopes), or by light directed through the objective (as used with metallurgical microscopes). Knob or slider for adjusting the brightness of the illumination. A holder for the specimen, normally of glass and of a standard size and thickness. Some early slides were made of wood or ivory. Before the use of glass to produce slides (it was expensive in the 18th and 19th centuries), specimens were usually mounted on small narrow ‘sliders’ made of bone or ivory. They normally held several specimens, each in a small circular hole. Solid objects were usually left uncovered, and transparent specimens were held between two thin pieces of mica. A defect in a lens that causes straight lines to appear curved, usually worse towards the edges of the image. A flat square or round plate fixed to the limb at right angles to the optical system, used to support the specimen or slide. Most stages of early microscopes were fitted with two spring clips to hold the slide in place, and low-priced microscopes still use this system. The position of the slide had to be adjusted by moving it with the fingers. More precise control is provided by a mechanical stage. A special microscope slide with a microscopic and very accurate ruler. Used to calibrate an eyepiece reticle for a particular objective, so that specimens can be measured accurately. A fixed size aperture that can be placed in the light path between the mirror and the specimen. Sometimes found on cheaper instruments, particularly from the Victorian period, taking the place of the substage iris diaphragm. The instrument would normally be supplied with two or more stops with different hole sizes. Part of the microscope attached to the limb under the stage and which holds the condenser, the diaphragm and usually a filter holder. It can normally be adjusted so as to move it towards or away from the stage. The normal lighting for transparent specimens, with the condenser focusing light onto and through the specimen before it enters the objective. The top-most part of a modern, modular microscope, fitted with a pair of inclined eyepiece tubes for viewing plus a vertical photo tube for attaching a camera. A microscope that has an inclined pair of binocular eyepieces, and also a vertical tube for attaching a camera. The distance from the bottom of the nosepiece to the top of the eyepiece tube. For many years, the standard distance was 160 mm, although older Leitz systems used 170 mm, and some metallurgical microscopes used longer distances such as 210 mm. These were all finite systems. Modern microscopes from major manufacturers now use infinite systems, where the tube length can be changed by inserting accessories without affecting the magnification. Technique for increasing the NA above 1.0 by using water to bridge the gap between the specimen and the bottom of the objective. Must not be used with objectives that are not designed for water immersion. An objective that is designed for use with water bridging the gap between the coverslip and the objective. An early form of binocular stereo instrument introduced by Francis Wenham in 1860. The light from the objective is split using a single prism, placed just above the objective, and passed into the two body tubes. The concept proved quite popular, and many manufacturers used the design in their ranges. Refers to an eyepiece with a field number (and therefore field of view) that is larger than normal. The eyepiece needs to be used with an objective that can provide a good image across the wider field of view. For covered specimens, the distance between the top of the coverslip and the front lens of the objective when the specimen is in focus. For uncovered specimens, the distance between the top of the specimen and the front lens of the objective. Ranges from a fraction of a millimetre for a high-magnification objective to several centimetres for a stereo microscope.